A self-taught, multimedia artist exploring the emotional, organic, energetic and spiritual realms of being. This piece beckons the viewer to enter into a passage way. It pulls one into oneself. Influenced by Celtic Shamanism, masks beckon the question "who? ", owls are creatures of the night - the mystery. 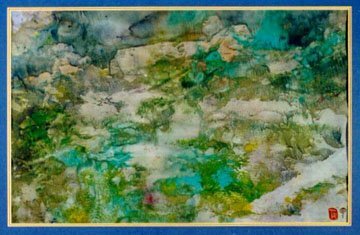 This image was created in the jungle of Southern Thailand using a brush stroke technique on handmade paper. Geckos and Lizards are reated to the dream world, hence the title "Dare to "Dream"